The album kicks things off with a thunderous drum dance. And we are treated to some heavy and outstanding riffing. The lead guitar lines are powerful and entrancing. The solos are furious and heavy in their reliance on exotic scale hopping. there are cacophonous moments, highly melodic slashing, and that tasty 80's sound. 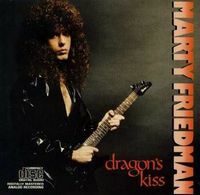 This is a standard high quality instrumental metal album released form an absolute gem of a guitarist, Marty Friedman. Where he would go on to do much less in this vein in lieu of more experimental and atmospheric affairs. Here, his goal is to roast you alive with virtuoso playing. There are those who would say this music has no soul, but he put a lot of effort into this, and the compositions can be quite strong. There are multiple song segments, and awe inspiring shred fests. The breathtaking riff that begins the title track is majestic whilst he bursts out with a visceral choral guitar wail that seems as if the machine is crying out in passionate pain. Then I must mention the eastern twinged break near the end of the song. There isn't very much diversity on this disc, however. It doesn't rely on solo's disguised as songs, either. There are real movements, and song structuring. That is also not to say he ventures too far form the standard shred album fare. This keeps the album form being brilliant. Evil thrill has a slow and plodding Black Sabbath style strut with some extra metallic bite, and Black Sabbath were never this violently melodic. I should also say that the drumming is moderately good, but by no means veteran playing. Namida is the main diversion on the record. It feels like an almost psychedelic romp. This is the greatest telling of what would come in the future of Friedman releases in the likes of Introduction or Scenes. Atmospheric and charming, with a soft scale run planted in that doesn't seem to overdo anything. Great, if a little mundane. Anvils returns to that ferocious storming Megadeth style raging metal. Crunching riffing, and wailing melodic flights of fancy. This is as over the top as instrumental metal can get, in a grand way. The melodies are strong, the playing is incredible, and he never solos for far too long like some other guitarists I won't mention. He also doesn't shy away from thick classic metal power playing. Jewel is a synthesizer touched faint ballad of sorts, and has an exquisitely pretty main melody. None of the songs are extremely complex, but they do have their progressive moments, and it is highly technical. The album's "epic" Forbidden City is absolutely splendid. Multiple fleshed out facets, and an ear for estranged melodies that weave themselves into and out of your ear. An album highlight, going from furious stomping grounds to fiery soloing, and thick screeching guitars. The record ends with Thunder March. It has such a quality and solid melody. True, Marty has given us a lot of brilliant melodies. They are always up front and easy to consume, while giving the listener a chance to dig deeper, as well. So, there are countless powerful melodies here, and the playing is first rate. The diversity takes several hits, and the compositions can be simple, at times, but the songs themselves stand up remarkably well. A brilliant and harmonious debut effort from a very skilled guitarist. Best Song - Forbidden City overall, but Dragon Mistress and Thunder March have the most powerful melodies. Worst Song - Perhaps Jewel for the lack of diversity, but nothing here is overtly bad.